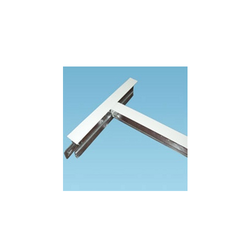 We are the leading manufacturer and exporter of T-Grid False Ceiling System. The products made available by us are protected from corrosion as they are roll-formed out of hot-dip galvanized steel. Being one of the preferred names of the industry, we are engaged in offering T-Grid False Ceiling System known for its ease of installation. These efficient systems are extensively famous in the market, owing to their tough construction, water resistance and longer operational life. The proposed series not only saves time and labor cost, but also provides one piece ceiling effect.